Adding an articulating computer monitor arm to your desk is something that will improve ergonomics. Being able to adjust the arm so that it bends and moves up and down from a joint allows you to move your monitor where you need it to be without straining to look at it. This will offer far more versatility than a regular monitor stand that can’t be adjusted. Granted, if you sit upright 100% of the time and don’t really move positions in your seat or stand up (which is terrible for you) then a regular old monitor stand or arm that doesn’t adjust may be just fine. It just lacks the aesthetics and versatility. Let’s give you some examples of the best options there are so you can see for yourself exactly what I’m talking about. 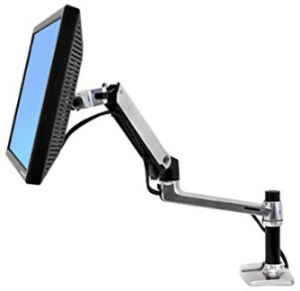 The Ergotron LX Desk Mount LCD Arm is a quality product that comes at a fair price. It has a good height range as well as a good range extending out. It extends 25 inches from the pole to the VESA mount that connects to your monitor. This means you can adjust the monitor from the back of your desk all the way to the front, or at least most of the way depending on the desk. It holds a monitor that weighs anywhere from 5 to 25 pounds. Which is a good range as some other arms tend to have a lesser maximum and a higher minimum weight. The reason there is a minimum weight is for the correct tension and some monitor arms tend to be closer to 10 pounds instead of 5. Also, the maximum of 25 pounds is more than most monitors weight. This can be a monitor up to 27 inches, which is listed as the largest monitor that will work for this monitor arm, however, looking at various reviews people claimed to have used larger monitors. Last but not least, it has a height range of 13.5 inches which means the monitor arm will adjust that high from the point you put it on the pole stand. The pole is 7 inches tall. So that means the maximum height would be right around 20 inches that the middle of your monitor would reach to. If that isn’t tall enough then they offer a taller pole that is 13.5 inches tall instead of 7 inches. This would be tall enough for just about anyone and would reach a maximum height off of your desk right around 26 inches. Check out this full video review to see the Ergotron LX in action. 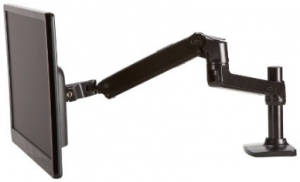 Just so you know, this is a near exact replica of the Ergotron LX Desk Mount LCD Arm only it’s black. Literally. It’s made from the same factory only it’s about $31 less. Unlike the Ergotron it doesn’t come with the 10-year warranty, it only comes with a 1-year warranty. Personally, I feel the 10-year warranty is worth the additional $31, also I think the chrome of the Ergotron LX is a little sleeker looking. It’s entirely subjective though. Also, the Amazon Basic doesn’t have a taller pole option like the Ergotron LX does. They do, however, offer a dual arm at a price quite a bit more affordable than the Ergotron LX and it may make sense to buy this option over theirs. 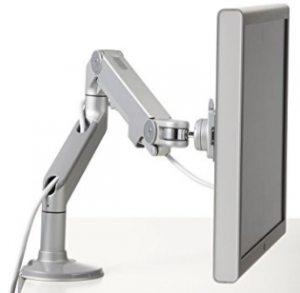 The Humanscale M8 Monitor Arm is the upscale option on this list. Like most of their products, it costs quite a bit more than everything else I recommend. This, however, is going to be ideal for someone that has a larger monitor that weighs more than the average monitor. The Humanscale M8 can hold up to 42 pounds, and as little as 8 pounds. Because of its ability to hold the additional weight, it is also sturdier in general. When adjusting it there is very little movement or wobbliness from the monitor arm. They offer a 10-year warranty which gives assurance you are getting a high-quality product. But they damn well better if you’re going to spend close to $400 for this product! The biggest flaws of the Humanscale M8 is that it only offers an 11.5-inch height range and a 22-inch depth range, which is less than the Ergotron LX. That being said, the monitor arm adjustment goes all the way up to 20 inches in total height. This will be tall enough for just about anybody. Humanscale also offers a dual monitor arm option for a little bit more, and they also have the M-Flex which can hold up to 6 monitors! There is only a select number of people that would need this option, but it’s a pretty cool feature. Overall, the Humanscale monitor arms come at the highest quality but you’re going to have to pay a premium price to get one. In my opinion, if price wasn’t an issue this is the best articulating monitor arm you can buy. 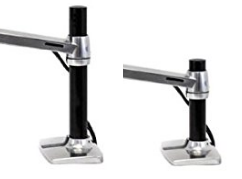 If you compare the videos shown between the different monitor arms you can see that the Humanscale M8 is really solid and doesn’t wobble at all when being adjusted. With the other monitor arms, they won’t be this solid and you will see some movement showing the difference in quality. The Ergotech Freedom Arm is a quality monitor arm that you can pick up cheaper than any of the before mentioned options. For some, this could make it the most attractive pick. It also has quality height and depth range. It extends 24 inches outwards and has a height extension of 14 inches. I contacted their customer service to get a clearer answer on the total height since it is pretty vague. However, the pole reaches 8 inches tall which would put the arm to a maximum height of 21.5″ above your desk (middle of your monitor). This makes it tall enough for just about anyone. They have 2 different versions, the regular Freedom Arm holds monitors ranging from 8.4 to 17.8 pounds. 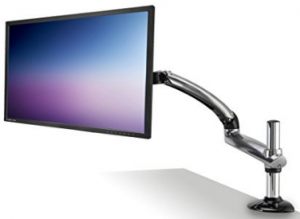 If you have a heavier monitor then they offer the Freedom Arm HD which holds anywhere from 20 to 30.4 pounds. The only issue I see with this is if your monitor weighs between 18 to 20 pounds. It would fall between both of these options so in that case, you may want to go with a different option than the Freedom Arm, but other than that very few monitors are going to weigh over 30 pounds so the maximum weight allowed is really good. Overall, this is a very high-quality monitor arm that comes at a very affordable price. Again, this may be the best option for the everyday middle-class person that doesn’t want to spend too much on a monitor arm. There are some other options you can go with, but after looking at several others these were the top choices in my opinion. I wanted to have an even cheaper option on here but I think you are going to lose a lot of quality by doing that. I personally tried the Suptek MD5211W Monitor Mount Stand which costs less than $40 thinking that it would be at least be functional. Unfortunately, it didn’t even hold my monitor upright. Maybe I just got a bad product and most work correctly. Or maybe I just didn’t tighten it correctly, but the instructions were so poor I wouldn’t know whether or not that was the case. Either way, the Ergotech Freedom Arm is quite affordable and the quality is top notch as well, so I think it makes sense to spend a little bit more and go with that if you are looking to save money. Can you use a monitor arm as a sit/stand desk? Because of the fact that you can get a monitor arm a lot cheaper than a sit/stand desk, people want to use this as a standing option at their desk. But does this really work? Short answer, no. I mean, you technically could but the ergonomics would be poor. Let me explain. Assuming you picked up the tallest of the options mentioned here (the Ergotron LX tall pole), have the tallest desk height (30 inches), have the largest monitor (27 inches) and tried using it as a standing option, then the top of the monitor would reach roughly 64 inches above the ground. This would be an ideal standing monitor height for someone about 5’10”. Now granted you could tilt your monitor upwards, so somebody taller than that could just look down and it would still work okay. Either way, as you can see there is a limited height level doing this. But the other problem is that you would still have to have a stand to put your keyboard on to raise that up as well. As you can now see, things are really getting complicated. And if you’re looking to save some money there are actually some pretty affordable sit/stand desk options available. So it just makes sense to do that instead of trying to use a monitor arm as a standing desk. Monitor arms may not make a good standing option at your desk. But they are a great addition to a sit/stand desk. When moving from a sitting to standing position people generally don’t keep the same distance from their eyes to their monitor. People tend to lay back when sitting and won’t be completely upright. This means that you need your monitor adjusted not only lower but closer to your desk as well. This gives you the option to easily adjust your monitor to where you need it when you go back and forth from different positions, giving you the ideal set up ergonomically. Being able to easily move around your monitor to any position you like gives you the flexibility to move positions freely and easily while at your desk. The options provided above I think are some of the best options on the market today. What about you? Have you tried an adjustable monitor arm? Are you thinking about getting one? Do you think these can improve ergonomics? Let me know in the comments below! This is a great alternative to the sit and stand desk. As a person who wears bifocal glasses, I have trouble with my neck if I sit at a computer too long. This would help me adjust the monitor to a level so that my neck would not hurt after working for an hour. You have several great choices for a reasonable prices. You bring up a great point with the keyboard still at the old level. I still think this would help my neck. And because of the keyboard height being so low is why I DON’T recommend it as an alternative to a sit/stand desk. But yes, these are great for anyone who deals with neck pain.